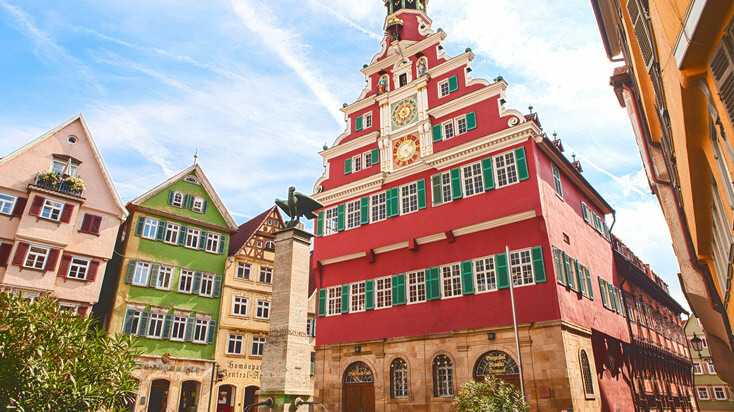 Search for the best flight prices from Manchester to Stuttgart. Compare prices, book today and save money with Manchester Airport. You’ll find Porsche and Mercedes here in all their glory, complete with lavish car museums. Look beyond the town’s serious, industrial side, though, to discover a place with over 1000 years of history, a well developed sense of culture, a friendly clubbing scene, and an ambitious, modern outlook on life. With its imposing architecture, high-end cultural scene and profusion of world-famous mineral spas, Stuttgart is a city that really knows how to do luxury. Much of the accommodation is at the pricier end of the spectrum – five-star Steigenberger Graf Zeppelin (Arnulf-Klett-Platz 7) sets a high standard with its rooftop spa and gourmet restaurant, while the equally luxurious Méridien Stuttgart (Willy-Brandt-Strasse 30) boasts an unrivalled location right on Schlossgarten Park. For something a little different, book into Der Zauberlehrling Design Hotel (Rosenstrasse 38); its 13 meticulously presented suites each channel a different culture and style ethic. Budget travellers will find friendly accommodation at the family-run Hotel Hottmann (Möhringer Strasse 99) in the south of the city. From funky vintage boutique Loffstoff (Breite Strasse 4) to local high-end designer label Horst Wanschura (Kronprinzenstrasse 28), Stuttgart is liberally scattered with fabulous fashion stores. The big chain outlets congregate around Königstrasse – but if your taste runs to the eclectic then head straight to the Bohnenviertel, where a rash of delectable boutiques cater for the city’s young and affluent. The Saturday market on Karlsplatz is a good place to find eccentric souvenirs, with the odd gem discoverable for those prepared to rummage through the bric-a-brac. Brunnenhannes (Geissstrasse 15) is also a must-visit – it sells fabulously kitsch traditional German outfits, perfect for festivals and fancy dress. Traditional Swabian institutions such as Stuttgarter Stäffele (Buschlestrasse 2) share street space with edgy avant-garde eateries to make Stuttgart one of Germany’s leading gourmet lights. Two-Michelin-star Speisenmeisterei (Schloss Hohenheim) is officially the best restaurant in the city; but its crown is increasingly being contested by Cube (Kleiner Schlossplatz 1). Housed within an incredible glass building, this is the place to be seen at the moment – try the surprisingly well-priced Mediterranean/Asian fusion lunchtime menu for a taste of what its talented kitchen team can do. If you’re really counting the pennies, then hipster hangout Weber (Calwer Strasse 52) serves a scrumptious brunch to the accompaniment of background jazz music. This is one of the biggest events in the European jazz calendar, and it attracts a glittering array of stars from all over the world. Dozens of open-air and indoor concerts take place across a number of venues. The biggest party of the summer in Stuttgart takes place over several days in August, when both locals and visitors come together to watch an incredible array of live music. Every genre from jazz and pop to Latin American and classical is represented. This Swabian wine festival is one of the largest in Germany. It runs over 12 days in late summer, and showcases around 500 different varieties of Wuerttemberg wines. It might not rival Oktoberfest in size and grandeur, but what this friendly festival lacks in range it more than makes up for in atmosphere. An incredible variety of both local and international brews are on offer, as well as fairground rides, entertainment tents and food stalls selling regional specialities. Held against the medieval backdrop of the Stiftskirche, Stuttgart’s Christmas market infuses the city with festive spirit. More than 200 stalls set up in Markplatz every year, selling Swabian produce and crafts to the accompaniment of Christmas music.